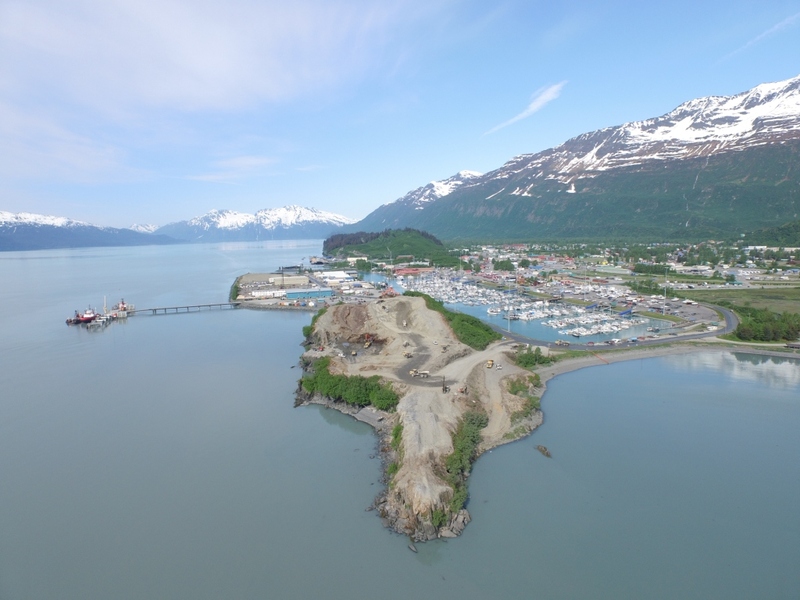 The City of Valdez New Harbor Development Project is a multi-year, phased project to build a new harbor basin and upland facilities on the south side of the old Hotel Hill site. The new harbor will include docks/moorage capacity, vehicle parking lot, additional vessel launch ramps, and support services. New access roads and pedestrian walkways will be included to provide increased waterfront accessibility. Pacific Pile and Marine (PPM) installed the remaining piling, floats and Gangway 3 for the Mooring Basin. PPM also finished installing fencing on the Drive-Down (DD) transfer bridge, installed the 6” thick Glulam decking, 2” wear surface, fenders, bullrails and two cranes on the DD float. PPM subcontractor Global Diving & Salvage welded anodes on the piling below water. The Madison Bay supply barge with pile driving equipment was towed off the site. On March 1, 2019, PPM suspended self-performed work and Punchlist activities until weather is favorable this spring. Harris Sand & Gravel (HSG) finished installing hangers and pipe for potable water, sewer and fire protection systems on the mooring basin floats. They continued installing insulated “Arctic” pipe on the DD transfer bridge and gangways, installed pipe for the fire protection system on the DD float and started installing pumps on the floats for the bilge and sewer systems. Puffin Electric continued installing power pedestals, pulling and terminating electrical cable at substations being installed on the floats. They also installed light poles at the south end of main floats, lights for the gangways, and pulled conduit to the light poles for fiber optic cable to security cameras. R&M continued processing submittals and resubmittals and responded to questions on design documents from field personnel. R&M also finished inspecting the drilling and driving of piling for mooring basin floats and inspected the above water portions of the drive-down and mooring floats with representatives from the City and PPM. The contract with USACE is still open and the City anticipates receiving financial information that will lead to closure. The Coast Guard still needs to install the Aids to Navigation features for the new harbor.